Bulgaria is a land of wild winter mountains offering some extraordinary opportunities for snowshoeing. With a reliable snowfall it is fast becoming a well recognised destination for winter activities. Bulgaria dates back to the 7th century making it one of the oldest states in Europe, and offering you, the visitor, a true cultural experience. During this week of snowshoeing we will hike in various national parks in the Rhodope, and Pirin mountains, mountain ranges which on average have 2 to 3 metres (6 to 9ft) of snow in winter - perfect! In addition, this trip features first class hotels that have been carefully chosen to show you Bulgaria in 'comfort'. Explore Trigrad Gorge, entrance to the "Kingdom of Hades"
The mountain ranges of Pirin and Rhodope provide excellent snowshoes routes and on this trip we will visit both areas. Both National Parks are home to a rich flora and fauna, including brown bears, jackals, wolves, wild boars, deer, and chamois. We will combine snowshoeing through pine forests, plateau, summits, and ridges, with the chance to experience the ancient culture of this beautiful country. With a professional local qualified guide you will have the chance to get 'under the skin' of Bulgaria learning about its turbulent past, and how its people see its future. With our starting point the ancient capital of Plovdiv, declared European Capital of Culture for 2019, we believe this to be an action packed itinerary! I was surprised by the scenery, absolutely stunning! The food was great, brilliant mix of cultures, with Austrian and Italian dishes. Never quite knew when to speak German or Italian, but loved the challenge. Oh, and the skiing was amazing, first class tracks and wonderful journeys that will stay with me forever. Today you will arrive at Sofia, the capital of Bulgaria, where you will meet your guide at the airport. Your flight should arrive no later than 1400hrs in time for the group transfer to the famous city of Plovdiv where you will be staying in a family hotel in the historical centre. The transfer by private minibus will take approximately 1h30. We will provide a time for the group pick up once we have everyones flight arrival times. Plovdiv an ancient, and beautiful city has been chosen the European Capital of Culture for 2019. It is one of the oldest cities in Europe and is rather like a huge museum where every building, street or square has a history of its own from prehistoric times right up until today. In the late afternoon your guide will take you on a tour of the highlights of the city. The city is also know as the 'Gateway to the Rhodope Mountains' our destination the following day. Today your guide will also brief you on the week ahead and answer any questions you might have. Today we leave behind the history and culture of the ancient city of Plovdiv and begin our journey into the mountains. The Rhodope National Park is famed for its rich flora and fauna, including brown bears, jackals and wolves. It is also home to some ancient trees over 500 years old, and is the only breeding area for griffon vultures in Bulgaria. Such has been the success of the recolonisation of the brown bears that bear-watching is now a bookable tourist activity! Our goal this morning is the town of Chepelare from where we will start our snowshoe hike. We begin by making our way through the lush Rhodope pine forest in the Siykovska valley eventually reaching our summit at 1720m (5641ft) where we can enjoy the views. The top gives a fantastic panorama over the central Rhodope massif and it is here that we can enjoy our picnic lunch while scanning the skies for those griffin vultures. In the afternoon we follow the main ridge south, through the Mechi Chal ski station, all the way to the Pamporovo resort. We end our day with a short transfer to the town of Smolyan, the capital of the high Rhodope mountains, where we will spend the night. Our day begins with a very short transfer to the area of the Smolyan lakes, our goal for today. The lakes are ten small, but beautifully located tectonic ponds. They earn there name from the fact they are a water-filled depression along the path of a 'fault' in the earths crust. After climbing to the ridge line we will reach the upper parts of the Pamporovo resort ski runs, arriving at the Studenets hut. We will take lunch in one of the restaurants in the ski area before continuing west towards the highest parts of the mountain, the Perelik ridge. From here we will be rewarded with the finest views of the region and we can take a breather, before finishing our snowshoe outing at the Prevala saddle, where our private minibus. It is then a short transfer to our hotel in the lovely traditional town of Trigrad, near the frontier with Greece. On the way we will pay a short visit to the Shiroka Laka village which is an open air architectural museum. Shiroka Laka is famous for its authentic Rhodopean houses set in tiers on both banks of the local river. Our dinner tonight will feature traditional dishes from Trigrad. Leaving the town of Trigrad behind we begin with a visit to the nearby Trigrad Gorge. The gorge, made up of vertical marble rocks, is well-known in Bulgaria, and in particular is famed for the Devil's Throat Cave, the legendary entrance to the underground kingdom of Hades. Indeed, the “Orpheus Mysteries” is one of the most interesting events in the region, with a festival held every year during the last weekend of July. After checking out the cave, and whether it truly is the entrance to Hades we put on our snowshoes for a walk through fantastic scenery, and the rockiest part of the mountain range, we we continue to the famous Yagodina cave. The cave is one of the most famous and most-visited caves in Bulgaria. Its galleries extend to a length of 8501m (2788ft), which makes it the 4th longest cave in the country, and the longest in the Rhodopes. At the end of today we will be transferred to the picturesque village of Leshten, situated on the western slopes of the Rhodopes and offering a marvellous panorama to the Pirin alpine range, named after Perun, the Slavic god of thunder. We finished our day yesterday with views to the Pirin mountains and that is exactly where we are heading today. In 1983 the Pirin National Park was designated a UNESCO World Heritage Site. The park contains 176 lakes among 400 square km (250 square miles) of fragrant pine forests and granite peaks. Fang-toothed predators make their home here – bears, wolves and jackals – but exploring on snowshoes we are more likely to spot the park’s abundant birdlife: wall-creepers, peregrine falcons and four types of woodpecker number among 170 species seen here. The Pirin mountains are also home to more than one hundred peaks reaching over 2000m (6560ft). Our snowshoe hike today will begin on the northeastern slopes of the Pirin mountains, at Gotse Delchev hut. An easy ascent with a chairlift ride takes us higher up the mountain, to the Bezbog hut. After our picnic lunch we will make our way to the summit of Bezbog 2645m (8675ft), where we can enjoy the stunning views of the rocky summits of the Pirin range. We have an optional climb of the nearby summit of Polejan which sits at 2851m (9351ft) and is one of the highest points of the Balkan peninsula. This option will be decided by your guide based on the group stamina, conditions and time available. We make our way back to the hut at Gotse Delchev and make are way to the famous ski resort of Bansko. No packing this morning, as we will be spending two nights in Bansko, so we have time to enjoy our breakfast with a more leisurely start. Today we will be doing one of the most well-known snowshoeing treks in Bulgaria, a round trip of the Bunderitsa cirque. We head first of all to the lush pine forests of Bunderitsa valley and the beginning of our trail. Once we have climbed above the trees one we will be greeted with a view of the imposing Mount Vihren, Pirin's marble giant! Mount Vihren which sits at 2914m (9557ft) is the highest point of the Pirin Mountains, third on the Balkans after Mount Musala in the Rila Mountains and Mount Mitikas in Greece. Its looks like a huge marble stone pyramid with its north face a 400m (5248ft) vertical wall. Once we have taken in the views of Vihren we will visit the Bunderitsa lakes. They all are named based on their shape and appearance, there is the Eye, the Frog, Long lake, Fish lake, the Spoon and the Green lake. After our lake tour we will return to the Vihren mountain hut and begin our journey back to Bansko where this evening we will have a traditional folklore dinner, arranged for you in one of the legendary Bansko taverns. This morning we begin with a drive to the capital city of Sofia, where we will be heading for Vitosha mountain and a snowshoe along the ridge line. Vitosha is the symbol of Sofia and a favorite place for local people for hiking, mountain bike and jogging in the summer, and skiing and snowshoeing in the winter months. Our vehicle will take us high up the mountain, and we will take our picnic lunch in one of the huts of the ski centre. This afternoon we will have a panoramic snowshoeing trek along the main ridge line of Vitosha. This hike offers easy terrain along a flat ridge top with stunning views to the Rila and Pirin ranges to the south and to the north the city of Sofia beneath our feet. After our final views we will descend to Bistritsa district and take our transfer to the city’s centre. Although this descent is the longest of the trip it is on easy terrain and is gradual. Tonight we will be in an very comfortable hotel in a central location to allow you to enjoy the city. We will be taking you out on the town and eating in a traditional restaurant so you can experience the sights and sounds of this ancient capital city. Today is your departure from Bulgaria, but before you go there will be the chance to enjoy a short tour of the capital city of Sofia which will be given by your guide. This walking tour will begin after breakfast, at approximately 0900hrs and will finish by 1100hrs, so that the group transfer can leave for the airport, arriving at 1130hrs. To allow time for this tour we suggest your flight is after 1330hrs. A group transfer to the airport is included in your trip fee. Extra nights in Sofia can easily be arranged if you would like to have more time in the capital. And, of course, if you would like to take an early flight on this day that it entirely up to you. Please note that in this case your transfer to the airport will not be included. It takes approximately 30 minutes by taxi from the city centre to the airport. On all our trips we aim to accommodate our guests in well-situated, clean, characterful, family run accommodation. Our suggested accommodation, listed below, is subject to availability at the time of booking. We have given details of our favoured venues and those we intend to use. If unavailable we will book alternative accommodation of a similar standard. However, on many of our trips single rooms are available on request for a supplementary fee. We recommend booking as early as possible to secure a single room as these are always limited in number. Please contact us for details. The hotels we aim to use on this trip are all 4* except for one night when we are in a 3* establishment. The hotel grading system in Bulgaria does not equate to that used in other European countries such as France, or Switzerland. However, a 4* hotel in Bulgaria is the best available, and will offer a good level of service and comfort, often with a swimming pool and spa area. Our 3* hotel in Plovdiv is situated in the heart of the old town centre, and a few minutes walk from all facilities. Although a relatively modern building it is designed in the style of a traditional Plovdiv townhouse. Plovdiv claims to be the oldest living city in Europe and sixth in the world. More than 8000 years of various ancient civilisations and culture are on your doorstep. All bedrooms at the Hotel Alafrangite have en suite facilities. Tonight we arrive in the town of Smolyan to our very comfortable 4* Hotel Kiparis Alpha which is right in the centre. The hotel has rooms with en suite facilities, and there is a spa area, with sauna, hammer, and hot tub, as well as a swimming pool where you can easy any tired muscles. The hotel is close to the main cultural landmarks and has great views to the mountains. The Rhodopean Drama Theatre, the Planetarium, the History Museum, and the Art Gallery are nearby. The second largest Orthodox temple in Bulgaria is also to be found in the town. The 4* Hotel Arkan Han is a family run hotel in quiet surroundings in the forest in the Rhodope Mountains, 3 km (1.8 miles) from Trigrad, close to the Trigrad Gorge. The restaurant serves traditional Bulgarian foods from the area, such as the famous yellow cheese, and buffalo's yogurt. The traditional architecture is combined with modern comfort and the bedrooms all are en suite, and some with a balcony. The village of Leshten is on the southern slopes of the Rhodope mountains, and this is where we find our hotel of the same name. The 4* Hotel Leshten offers lovely views of the both the Mesta River and the Rhodope Mountains. the hotel bedrooms are all en suite and some have balconies. The restaurant offers unique wines from one of the oldest wineries in the country, winery Asenovgrad . Delicious Bulgarian dishes are prepared from organic products, and old family recipes. The architecture of the hotel is entirely geared towards the preservation of the unique Bulgarian customs and culture. Building structures are made from environmentally friendly and quality materials , mainly wood, stone and wrought iron, made by local craftsmen. Tonight we are in the ski resort of Bansko, sometimes referred to as the Bulgarian version of Chamonix, France! Our hotel is the 4* Hotel Casa Karina, a modern hotel with en suite bedrooms, excellent buffet meals, and a spa area with sauna, and hammam. There is also a swimming pool, which is always a bonus after a day of snowshoeing in the mountains, and there is a range of massages and treatments are available. Meals are buffet style and plentiful. In the capital city of Sofia we stay at the 4* Hotel Sveta Sofia, which means Saint Sofia. The hotel is perfectly located on a quiet pedestrianised street in the centre of the city and close to all facilities as well as to the main tourist attractions, sights, shopping centres, restaurants, cafes and nightclubs. The hotel is just 5 minutes walk from Serdika Metro Station. The bedrooms have en suite facilities, and air conditioning. Sofia Market Hall and the famous Women's Market can be reached on foot in just a few minutes, and Sofia Airport is just 9km (5.6 miles) away. Shuttle services to the airport are offered by the Hotel upon request and at a surcharge. On arrival your meeting point is the airport in Sofia, the capital of Bulgaria. You will meet your guide at the airport at a time that will be confirmed once we have all the arrival times of the members of your group. Your flight should arrive no later than 1400hrs in time for the group transfer to the famous city of Plovdiv where you will be staying in a family hotel in the historical centre. The transfer by private minibus will take approximately 1h30. If you arrive early in the morning it is easy to visit Sofia while waiting for other group members to arrive, but we do ask that you return to the airport for the group transfer. The airport in Sofia is less than 30 minutes from the city centre. We will provide a time for the group pick-up at the airport once we have everyones flight arrival times. On your departure day you will be transferred to Sofia airport, but before you go there will be the chance to enjoy a short tour of the capital city of Sofia which will be given by your guide. This walking tour will begin after breakfast, at approximately 0900hrs and will finish by 1100hrs, so that the group transfer can leave for the airport, arriving at 1130hrs. To allow time for this tour we suggest your flight is after 1330hrs. A group transfer to the airport is included in your trip fee. When booking a holiday as a solo traveller a twin bedded room comprising of two single beds, is booked as standard. This will be with someone of the same gender unless you request to pay extra for your own room. Single rooms are often limited in supply so if you would like to pay a supplement for a single room we urge you to get in touch as soon as possible. This trip has a single supplement of £135. Please note that on this particular trip you will exceed the stated maximum altitude for our Moderate trips. On the day we climb Bezbog we will reach 2645m (8675ft), and we have an optional climb of the nearby summit of Polejan which sits at 2851m (9351ft). However, as indicated in the full grade description to reach this height we will have had the assistance of a chairlift ride. "This is for you if you would like to walk in the mountains in winter, but your experience of snowshoeing is limited or zero! On these trips full instruction is given on snowshoe technique and equipment. In reality you just need to be able to walk, it is that easy. However, we will be walking in the mountains and we expect that you take regular exercise that involves climbing up hills and have a reasonable level of fitness. We will walk on a variety of terrain from flat to steeply undulating, most of the time we will be walking on a trail, but if there is fresh snow we will enjoy making our own track. We may on rare occasions reach an altitude of up to 2500m (8200ft), but we will sometimes take a cable car to get there. We may complete ascents/descents of between 300–500m (984-1640ft) per day with one longer day of up to 750m (2460ft). Expect to be out on the mountain for between 4 – 6 hours per day." In Bulgaria, the climate is continental, with cold winters and warm or hot summers; it is slightly milder along the coast of the Black Sea, and of course colder in the hills and mountains where you will be snowshoeing. The country is exposed to both cold air masses from northern Europe or Russia, and warm air masses from the Mediterranean or North Africa. In winter, which last from December to February, it is cold throughout the country. Cold air often stagnates on the plains, with cloudy skies and light snowfalls, but these periods may be interrupted by warm winds from the south, which can raise the temperature to 15°Celsius (59 °F) and more, and more frequently by cold air outbreaks from Russia, which can bring strong winds followed by severe frosts. In the town of Smolyan, one of your overnights, the average temperatures ranges are given as a minimum in February of -3°Celsius (26.6°F) and a maximum average of 10°Celsius (50°F). In April you can expect temperatures to range from 4°Celsius (39.2°F) to 18°Celsius (64.4°F). Note that in the mountains where you will actually be on snowshoes the temperatures will be lower. Although Bulgaria is in the EU it has not adopted the Euro currency. For Bulgaria you will need to purchase LEV on arrival. It is best to do this once you have been collected by your guide and not to do this at the airport where the exchange rate is poor. Your guide will take you to an exchange facility on the way to Plovdiv. All towns, and even small villages will have ATM machines where you can extract LEV. The currency code for Lev is BGN, and the currency symbol is лв. Current exchange rates. You might like to consider extending your trip with extra nights at the beginning in the beautiful city of Plovdiv, the European Capital of Culture for 2019, or with extra nights at the end in the capital city of Sofia. Both cities are well worth a visit with a rich and varied culture and heritage. For details of how to get direct to Plovdiv by public transport click here. For information about visiting Sofia click here. We believe you should book this trip with Tracks and Trails if you feel strongly about supporting people who are working hard to create a future in their own country. In the case of Bulgaria this is a country with a turbulent political past. We decided to work with our snowshoe guide, Stoyan Milkov and his colleagues because of the dedication and passion they have for their culture and their traditions. Having visited Bulgaria to spend time snowshoeing with Stoyan we were impressed to witness the effort he is putting into promoting Bulgaria as a destination for adventure holidays. As well as developing a market for snowshoeing he is working to increase the amount of hikers, mountain bikers, and trail runners arriving in Bulgaria. The wearing of an avalanche transceiver, a simple beacon which transmits a signal, is compulsory for all our snowshoe trips and is standard practice for winter sports. We choose to supply them in Bulgaria even although other companies choose not to. In summary we believe in paying our local agents/guides a fair price for their services, ensuring that you have a holiday that is 'above standard' for Bulgaria, good value for money, and supporting the local economy. We know that when you spend this week with Stoyan, or one of his excellent colleagues, you will learn more about Bulgaria and the Balkans in seven days than you possibly could travelling on your own. 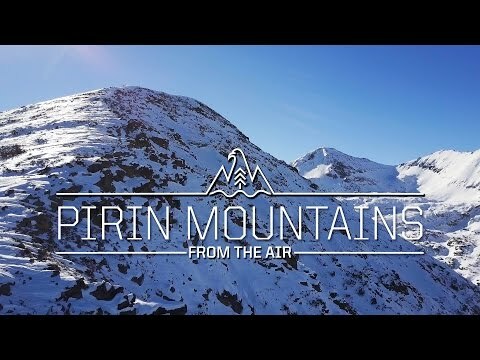 An aerial tour of the Pirin Mountains above Bansko and Bezbog, with views across to the Rila Mountain range. We will visit Bankso and Bezbog during our snowshoe tour of Bulgaria. 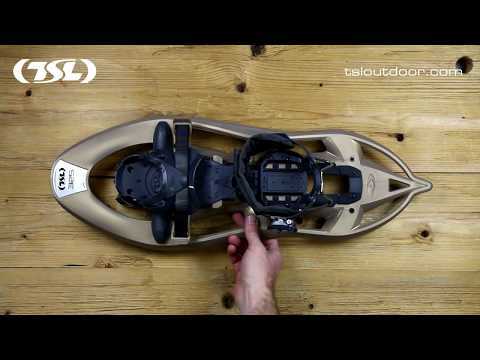 How snowshoes work, and how you should fit them to your walking boots. There are many different models of TSL snowshoes, and this might not be the exact one you will use but it will be similar. In Bulgaria we also use Inook snowshoes if required as they will fit a slightly larger boot.